Prawns thermidor is a counterpart of the well known lobster thermidor. Since lobster is so expensive and hard to find, you can use jumbo shrimps or large prawns as substitute for this elegant seafood dish. The recipe I have here have only few ingredients and cooking is not as hard as you think. Actually this is a kind of stuffed shrimp or shrimp relleno. Where you scoop out the meat from the shrimp, chop the meat and mix it with onion, butter, flour, egg yolk, milk and grated cheese then season with salt, MSG and calamansi juice. Then stuff the shrimp shell with the mixture, top with crumbs and bake until golden brown. 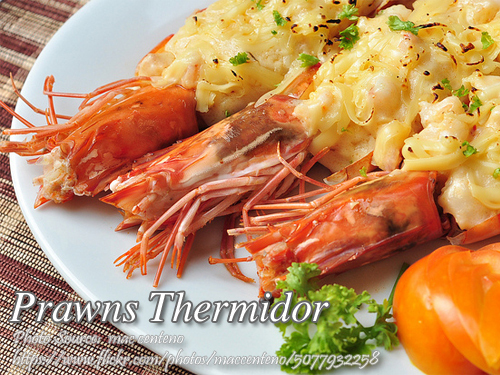 To cook this prawn thermidor; Cook prawns in a little water over low fire for 15 minutes. Cut shell at the back and scoop out meat. set aside the shell and chop meat coarsely. Saute onion in butter and lower heat then add flour. Stir well. Remove from heat and gradually add milk, egg yolk (slightly beaten), and half of the grated cheese. Season with salt, MSG, and calamansi juice. Lastly, add the prawn meat. Continue cooking until the mixture thickens. Fill prawn shell with cooked mixture, top with bread crumbs and the remaining grated cheese. Bake in a preheated oven (375 °F) and bake for 20 to 30 minutes or until topping becomes golden brown. To see the complete recipe with the exact measurement of ingredients, continue reading. Prawns thermidor is a counterpart of the well known lobster thermidor. Cook prawns in a little water over low fire for 15 minutes. Cut shell at the back and scoop out meat. set aside the shell and chop meat coarsely. Saute onion in butter and lower heat then add flour. Stir well. Remove from heat and gradually add milk, egg yolk (slightly beaten), and half of the grated cheese. Season with salt, MSG, and calamansi juice. Lastly, add the prawn meat. Continue cooking until the mixture thickens. Fill prawn shell with cooked mixture, top with bread crumbs and the remaining grated cheese. Bake in a preheated oven (375 °F) and bake for 20 to 30 minutes or until topping becomes golden brown. This is a nice addition to my menu! Thanks! HI Jenny, thanks for dropping by! Please visit again on my blog!